makes it easy, especially if the idea of camping makes you a little uncomfortable. You pick your spot or campground, and we deliver. Our campers are 2015 Shasta Airflyte trailers that are reissued and look exactly like the original 1961 Airflytes but with modern conveniences like a bathroom, stainless steel appliances, LED lighting, and Bluetooth speakers both inside and out! We also provide a record player and records. The Flying Ham will drop off and set up the camper or ham as we prefer to call them at your location of choice. All you have to do is show up. After your vacation is over, we will pick up the ham and that is it. It works just like a hotel stay. If you plan on staying in the Nashville area, we are proud to offer free delivery, no need to tow the camper! Our hams will make your stay unique and very comfortable whether it’s your first camping adventure, or you just want to try something different. 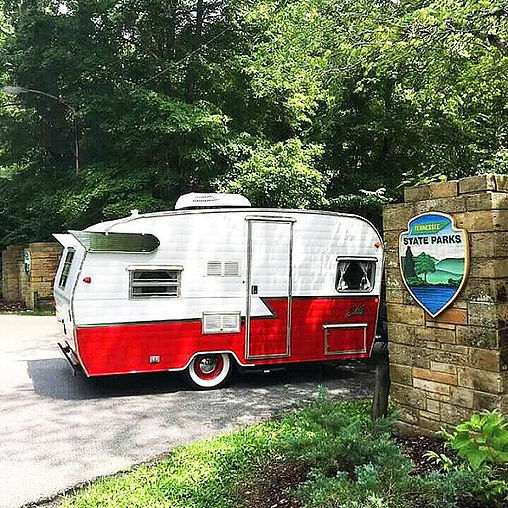 If you haven’t explored Tennessee’s state parks or campgrounds now is the time, especially in the fall. With the leaves turning their magical colors and the weather a little cooler, a night in the ham or a hike in the woods can create the memories that couples and families remember forever. The Flying Ham would like to suggest a few of our favorites within the Nashville area to give you a head start. The first is Montgomery Bell State Park. Montgomery Bell State Park is 37 miles west of Nashville. It provides some very nice creek front camping sites along with some hiking in the green hills of Tennessee. You can also throw your line in the water at Lake Woodhaven for bass, bream or catfish. If you are tired of roughing it though, the park also has golfing, boating and swimming on a lake beach. You can even enjoy some casual dining at The Forge Restaurant located within the park. You just can’t beat the overall camping experience you get from a stay at Montgomery Bell, and of course in a ham. Our second featured campground and a must for the hiking enthusiast is the 900 acre Cedars of Lebanon state park. Cedars of Lebanon state park is 32 miles east of Nashville. The most notable hike and one that children can enjoy as well is Hidden Springs trail. This trail is roughly 4 miles long and filled with amazing sinkholes, caves and very dramatic rock formations. The best part is after your adventure you can cool off in their Olympic-sized pool that is 12 feet deep with a diving board, and a smaller two foot wading pool for children. I would also recommend for a more private camping experience to stay in the campground 2 section. If the lake is more your style then you won’t want to miss a chance to stay at the Safe Harbor RV Resort. It is 13 miles from downtown Nashville on Percy Priest Lake. It has lakefront sites, sand beach, pool, and playground. They also have kayak, paddleboard, and boat rentals. We also enjoy a relaxing weekend at Cedar Creek in Mt. Juliet and Bledsoe Creek State Park in Gallatin. These two campgrounds offer great views of the lake while you make your s’mores at a very affordable price. We hope this has given you a little help in deciding the different ways to enjoy the outdoors of our beautiful state. However, if you truly want a staycation The Flying Ham can bring the camper to your driveway or backyard. The hams are great for extra house guests, birthday parties, photo shoots and weddings. We can also accommodate longer adventures to Falls Creek Falls or the Smoky Mountains, just tell us where and we will make it happen. For more information on the campgrounds we have listed visit our places to camp section on our website www.theflyingham.com or on Instagram at @flyinghamrentals. Also, don’t forget to pick up some awesome outdoor apparel from our friends at Tristar Adventures! Follow along on Instagram at @tristaradventures and visit their website at www.tristaradventures.com.